Alliance Business School Alliance University is ranked among top B-Schools in Bangalore. Alliance Business School offers best infrastructure & academic facilities. Amity Global Business School has been constantly ranked amongst the top business schools. Amity Global Business School offers placement in best corporate companies. Faculty of Management Studies Delhi focuses on management education more than just business management. FMS Delhi offers MBA course in various specializations. Great Lakes Institute of Management Chennai aims to be one of the leading management colleges in India. Great Lakes Management Institute offers PGPM & PGDM courses. ICFAI Business School Hyderabad is a constituent of the ICFAI Foundation for Higher Education. IBS Hyderabad is ranked among the top 20 B-Schools in India. IIM Ahmedabad was established in 1961. IIMA has been constantly ranked as the best management colleges in the country by several national agencies. IIM Bangalore was established in 1973 & offers degree/diploma granting programmes. IIM Bangalore provides access to world-class learning infrastructure. Indian Institute of Management Calcutta was founded in 1961. IIM Calcutta is one of the best business schools offering highly rated business management courses. IIM Indore is committed to excellence in management education & research. Established in 1996, IIM Indore has been one of the top management colleges in India. IIM Kozhikode was set up in 1996 by the Govt. of India in collaboration with State Govt. of Kerala. IIM Kozhikode is one of the fastest growing B-Schools in India. IIM Lucknow is one of leading business schools in India imparting knowledge in various management courses. IIM Lucknow was started in the year 1984. IIM Trichy is the 11th IIM and was instituted in 2011. IIM Trichy aims to develop competent & professional management graduates. Indian Institute of Foreign Trade Delhi is autonomous business schools started in 1963. Indian School of Business Hyderabad offers various postgraduate management courses. ISB Hyderabad has evolved as one of the best management schools in India. Institute of Management Studies BHU was established in 1968. Institute of Management Studies BHU provides best infrastructure & facilities to its students. Institute of Management - Christ University was established in 1994. The management program at Institute of Management-Christ University is a 2-year MBA program. Institute of Management Technology Ghaziabad is one of the premier business schools in India. Institute of Management Technology Ghaziabad was established in 1980. Institute of Rural management Anand was established in 1979. IRMA Anand provides PG management education to meet challenges that arise from dynamic markets. Jamnalal Bajaj Institute Of Management Studies is unique in management education. Started in 1965, JBIMS has full-time faculty in the core management disciplines. K. J. Somaiya Institute of Management Studies provides state-of-the-art education of global standards. KJ SIMS is one of the best B-Schools in India. Kristu Jayanti College Bangalore offers 2-years management course i.e. MBA. Kristu Jayanti College was founded in 1999 and is affiliated to Bangalore University. Founded in 1995, Lal Bahadur Shastri Institute of Management has emerged as one of the top business schools in India. LBSIM provides value based management education. Loyola Institute Of Business Administration is one of the premier management schools in India. Loyola Institute of Business Administration was established in 1979. M S Ramaiah Institute of Management was established in 1995 by Gokula Education Foundation. MSRIM Bangalore is known as Postgraduate center for management education. Management Development Institute is one of the top B-Schools in India. The PG Programmes in Management offered by MDI is approved by AICTE and awarded A grade by NBA. Mudra Institute Of Communications Ahmdedabad was started in 1991. MICA is an autonomous institution offering postgraduate management education. Narsee Monjee Institute of Management Studies is one of the top 10 B-schools in India. NMIMS Mumbai offers full-time MBA course in various specializations. PES University is one of the most sought-after management schools in Bangalore. PES University offers 2-year MBA course in various specializations. School of Management-Presidency University equips students with right knowledge. The MBA course at School of Management-Presidency University is approved by AICTE. SDM Institute of Management Development is one of the premier B-schools established in 1993. SDMIMD provides quality management education to young aspirants. SP Jain Institute of Management & Research is one of the best B-Schools in India. Started in 1981, SPJIMR offers postgraduate management programmes in various streams. St Joseph's Institute of Management is one of the top B-schools in Bangalore. St Joseph's Institute of Management offers best placement opportunities in reputed companies. Symbiosis Centre For Management And Human Resource Development was established in 1993. SCMHRD provides quality management education in various fields. Symbiosis Institute of Business Management Bengaluru provides full time MBA, E-MBA, PGDM & EDPs programmes. SIBM Bangalore was established in the year 2008. Symbiosis Institute of Business Management Pune is one of the premier B-Schools in India. SIBM Pune offers two-year full-time MBA programme in Pune. Established in 1980, T A Pai Management Institute Manipal is one among the top business schools in India. TAPMI Manipal offers PGDM course in various disciplines. Xavier Institute of Management & Entrepreneurship has been approved by AICTE for its fulltime PGDM course. XIME is one among the best business schools in India. Xavier Institute of Management Bhubaneswar is recognized as a world-class business school offering MBA and E-MBA courses. XIMB was started in 1987. XLRI - Xavier School of Management Jamshedpur was founded in 1949. XLRI has been exceptional in offering best placement opportunities in reputed companies. MBA Admission in top MBA colleges in India is based on the score obtained in competitive MBA entrance exams like CAT, MAT, etc. Higher the score, better the chances of getting a high ranked B-school. MBA admission process for different MBA colleges in India is almost similar. However, the difference is their acceptability of MBA entrance exam score. Most of the B-Schools accept CAT & MAT scores, whereas few colleges demand desired score in specific entrance exam. Generally, the B-schools in India announce the minimum cutoff score in a particular entrance exam to short list the candidates. The candidates should obtain a minimum required score to get shortlisted by the colleges. Based on the applications received from the eligible candidates, the MBA colleges conduct selection process, which includes Written Test, Group Interview and Personal Interview. Based on the applications received from the eligible candidates, the MBA colleges conduct selection process, which includes Written Test, Group Interview and Personal Interview. Some MBA colleges in India also give weightage to academic records, diversity & work experience of the candidates. The final selection of the candidates is based on their performance in the selection rounds. However, some States like Karnataka, Maharashtra conduct counselling at State Level to select candidates for Govt. quota seats based on the marks obtained in their State level entrance exams. Getting an MBA degree is an excellent way to progress in your current career or break into a new one. MBA graduates from top MBA colleges in India are in great demand in India and abroad due to the skills and knowledge, they have received at their college level. One of the major criteria to become successful in the field of management or business is the selection of the right MBA College. Securing MBA admission in one of the best business schools depends on the score obtained in competitive entrance exam. Apart from having a good score, it also depends on how well you are aware of the selection process of the top MBA colleges. With so many B-schools out there, it is difficult to stay updated with the application & selection process of different MBA colleges. Therefore, professional guidance is always helpful to stay updated with the college information and track your possibilities of securing MBA admission in best B-School. Securing MBA admission in one of the best business schools depends on the score obtained in competitive entrance exam. Apart from having a good score, it also depends on how well you are aware of the selection process of the top MBA colleges. With so many B-schools out there, it is difficult to stay updated with the application & selection process of different MBA colleges. Therefore, professional guidance is always helpful to stay updated with the college information and track your possibilities of securing MBA admission in best B-School. A professional MBA college admission consultant helps you in finding the right MBA College that not only provides quality education but also good placement opportunities from top companies. The purpose of conducting MBA entrance exams in India is to select candidates for management courses. Securing MBA admission in any of the top MBA colleges is highly competitive as the colleges look for candidates who have performed really well in competitive entrance exams and interviews. Each college sets minimum criteria to shortlist candidates for MBA course. However, many deserving candidates are not able to perform well in the MBA entrance exam or interview. Fortunately, there is a scope for such candidates to secure direct MBA admission in India. 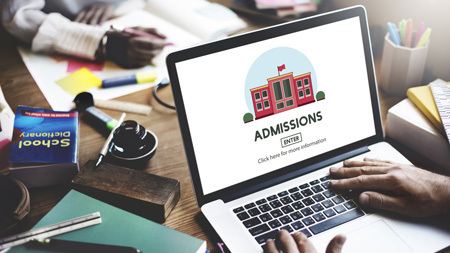 Many private MBA colleges in India offer direct MBA admission and accept students based on graduation marks or competitive MBA entrance exam, irrespective of the scores obtained. However, the candidates may have to undergo selection process, which may include a telephonic round, group discussion, or personal interview. Through Direct MBA admission, the deserving candidates who could not secure marks up to their potential will get an opportunity to pursue their dream of becoming an MBA graduate in a particular specialization.